This Ars Technica article discusses the design principles of the Star Trek LCARS touch-based user interface from The Next Generation as it was imagined in 1987 and how it relates to Apple's iPad. 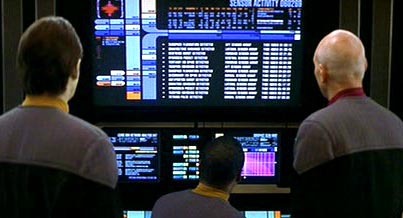 Reading this article led me to wonder: what are some other examples of interesting, inspiring, forward-thinking user interfaces from sci-fi universes? Please add references or imagery where possible, and try to talk a bit about why it's interesting. Dedicated consoles or rooms for the UI, for example the sanctum for accessing Mother in Alien –the UI for which was basically a VT100. Cool, but an unnecessary inconvenience given networking abilities. However, the point wasn’t that this was a technically superior future UI, but to suggested a secretive hierarchical society. 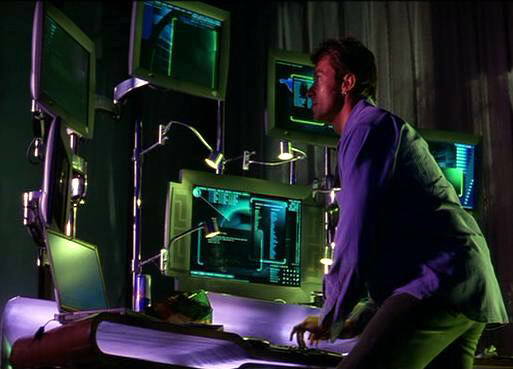 Transparent vertical screens or images, such as in Minority Report, but I seem to remember first seeing it in the original Battlestar Galactica series. These make it difficult to read the images due to interference from the background. However, it allows the audience to see the character’s faces as they study the images. Voice UI, such as seen in Star Trek and various others. As pointed out in Ars Technica article linked by the OP, voice interaction is often much less convenient than “doing the action yourself” by direct manipulation. However, it allows the characters to conduct dialog with the technology, which engages the audience more than just a character quietly staring at a screen and clicking something occasionally. 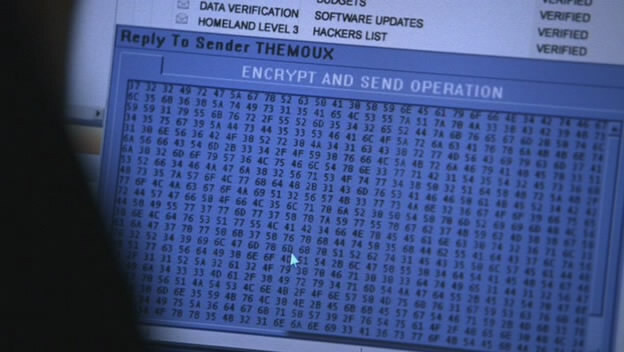 Anthropomorphic UIs, such as Holly in Red Dwarf and various robots. In the real world this is typically a waste of resources that makes an awkward UI that can even be creepy. We’re better off with simple dumb check-in kiosks at the airport than robot ticket agents. However, anthropomorphism allows the technology itself to become a character, which can advance the story. Hardware dependence, for example the “tape” tiles in Star Trek TOS, the encryption-cracking circuit board in Sneakers, or sub-mini laser disks in Star Cops. Recordings and devices are often easier to handle and more robust when composed of bits of information rather than physical material. However, actors need props to help express their characters and interact with others. Binary inputs, such as push-buttons and touch interfaces. 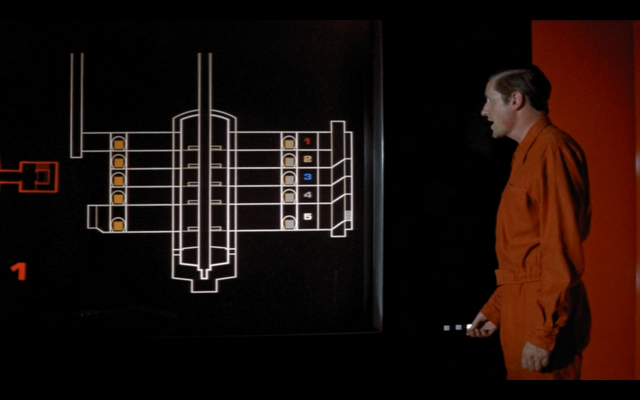 For analog inputs, you can’t beat knobs, leavers, and joysticks, yet these are relatively rarely seen on SciFi sets. Wouldn’t Sulu rather steer the Enterprise with a sidestick? However, knobs, leavers, and such are relatively expensive for set builders to make or buy, so they’re kept to a minimum. Slow screen redraws, as seen in various TV and movies. Even simple short phrases like “Access Denied” are shown with each character appearing one at a time from left to right, as if the connection were about 48 BAUD (often with light beep-beep-beep sound effects for each character). Today’s computers can refresh an entire screen instantly, making users more productive. However, slower animation allows text or images to emerge dramatically. One UI you rarely see in SciFi is thought-controlled UIs, even though it’s “obviously” the ultimate in intuitiveness and speed. That’s because thinking doesn’t give the audience much to look at. The movie Firefox featured a Soviet fighter with thought control, but when it came time for the protagonist to use it, he ended up speaking his thoughts slowly aloud –sort of defeating the entire advantage of a thought-controlled UI. 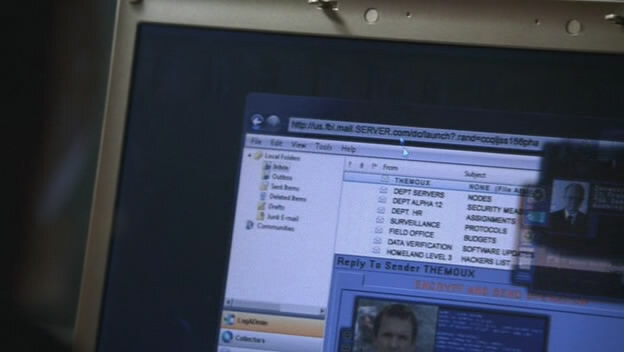 The desk interface from the movie "The Island". Interesting blend somewhere between Microsofts Surface and more tactile products like Siftables. 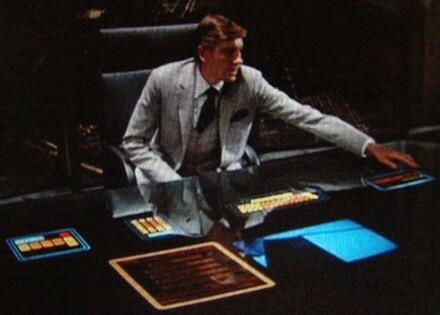 Tron (1982) showed a device very similar to a multi-touch surface. The one used to communicate with the MCP. and when kids create firewalls in 3d in social welfare facility (11 episode) don't have image. Minority Report is usually one that people mention. Microsoft Kinect is definitely a step in that direction, at least in a hardware sense. However, I think we ultimately end up with a mind/machine interface. For a different direction, take a look at the Aurora Concept Browser. Avatar and lots of movies like it, had interesting UI inside robots and giant machines. 3D interfaces where people can move things by hand in an imaginary space, rotate earth and stars by some gestures. that's interesting. Anyone interested in the subject should definitely check out Nathan Shedroff´s notes from his presentation at dconstruct/ux week. I was really blown away by the realistic UI of the Iron Man suit. It seemed like it was actually "designed" rather than just being part of the "effects." If that makes sense. The suit followed his eye movements and depending on what he looked at, the system provided information on that object. The UI even gets streamlined with the Mark 3 suit. Really geeked out on that part of the movie. The mech suit in District 9 is another great example. 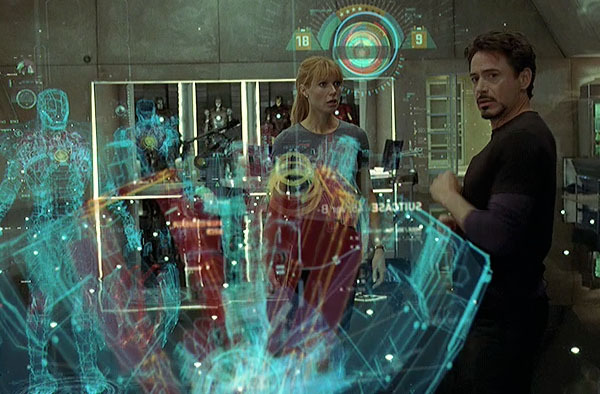 Although it didn't feel as polished as the Iron Man UI, it did offer some interesting ideas. When it was under fire, for example, it pointed out (with colored "pings") what direction the shots came from. It also looked like it plugged in directly to his brain. There's a part where it sounds like he's muttering calculations. After an instant or two, he fires on his enemies with great precision. Also in District 9, I really liked the navigation UI of the alien ship. http://www.youtube.com/watch?v=HicHPRZs6GI&list=PLCC0CF402CF60B949 I've always wondered how we would navigate effectively in 3 dimensions like space or underwater. This interface looks pretty advanced and looks like it was created specifically with that 3rd axis in mind. The ultimate UI was the control interface to the ship Andromeda. that's the only kind of UI I want. ...he also had a device which looked rather like a largish electronic calculator. This had about a hundred tiny flat press buttons and a screen about four inches square on which any one of a million "pages" could be summoned at a moment's notice. It looked insanely complicated, and this was one of the reasons why the snug plastic cover it fitted into had the words Don't Panic printed on it in large friendly letters. The other reason was that this device was in fact that most remarkable of all books ever to come out of the great publishing corporations of Ursa Minor - The Hitch Hiker's Guide to the Galaxy. The reason why it was published in the form of a micro sub meson electronic component is that if it were printed in normal book form, an interstellar hitch hiker would require several inconveniently large buildings to carry it around in. Some shots of an 24 episode. Never been a fan of what they did with the interfaces. In this case, a weird mail client/hybrid, with some encoding and personnel files going on. If you base it on the windows 7 GUI, please don't add weird looking stuff.. The movie "Gamer" has a concept that is quite intriguing. As a player you control the actions of another human being. Without going into the plot of the movie, I'll attempt to explain the controls or UI. 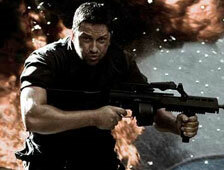 The main character in the game(Gerard Butler) is being control in a real life "war game". 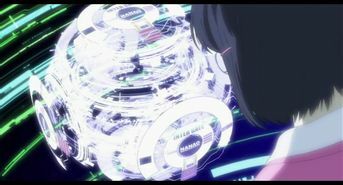 The player is sitting in his room surrounded by tv screens 360 degrees around him and above him. His bodily actions control Gerard Butlers character within the game. I tried to find images online of the kid in his room standing up with his arms in a "gun shaped position" playing the game, but couldn't come up with any. A youtube search for "Gamer movie" may show something(I'm at work, no youtube allowed..shhh!) It is like Microsoft Kinect on super steroids! There is another part of the plot where a man controls a woman in a Sims like surrounding, however it was in real life. The woman who was being controlled would actually "go to work" where she would then be connected to her controller. The controller could then tell her to walk up to people to talk, act crazy etc. Pretty much like Sims... In this case, the controller(man) would wear like goggles on his face, to see, but the control was through his thoughts and voice. In both cases, the character that was being played was controlled by thought(? ), speech and action. The UI was almost invisible at play time or when they started the game. But, in certain scenes, you would see the player setting up the game and they would use full body actions to slide things across the screen, etc., like Minority Report. The concept of making the UI as transparent as possible is the goal we may be working towards. Here's another one from Tron. The Minority Report interface actually exists in reality. Update: Changed the link. Original link was here. You may well be interested in this book that's due out soon and the accompanying 1 hour video on the subject by the authors. The Table UI from the latest Bond movie, Quantum of Solace, designed by MK12 and related UIs/devices, has been somewhat of an inspiration for me in terms of UI design. As tricky as transparent wall displays can be (have to get the lighting right for it to be properly visible), I like MK12's take on context diving. 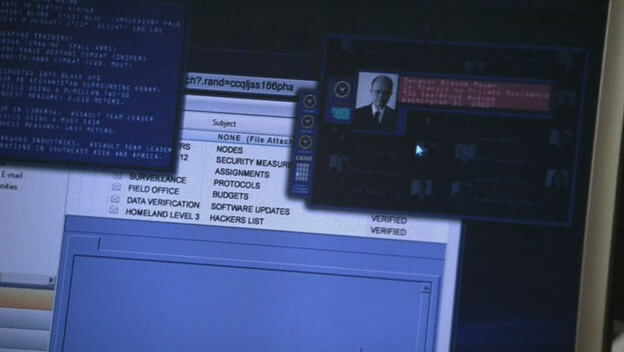 A number of TV shows and movies have used variations of CDE, OpenLook and TWM as their UIs, especially when they want to look super-techie and show lots of command line stuff. I personally thought that some of the infographics in the city scenes aboard the Axiom in Wall-E were actually quite amazing. It was "for dummies" all the way, but I really liked it. 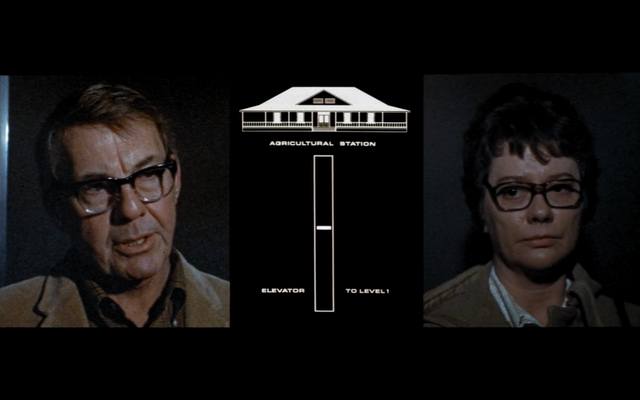 Robert Wise's 1971 adaption of Michael Crichton's The Andromeda Strain has some of the earliest and most wonderful user interfaces ever created for film. Douglas Trumbull's effects work was amazing and ground breaking and at the time. More importantly though, these interfaces were plot devices, providing engaging means of narration and exposition.These interfaces were not designed to exist in the film's universe alone. They are often given full or splitscreen presentation directly to the audience. 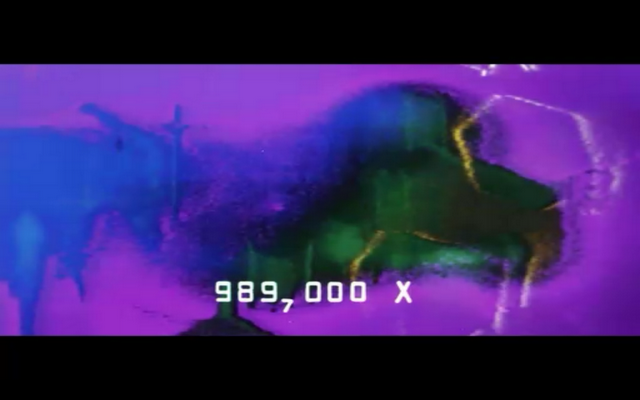 These computer graphics are without question a character in the film, a character which expresses itself succinctly. This seems at odds with the window dressing role that interfaces often play in films today. I think the most forward thinking UI is the natural speech recognition. I don't know who came up with the idea first of being able to simply talk to the computer, but it is certainly a key thing in the Star Trek series. It has inspired different companies in the early and late nineties to develop speech recognition software. Most luxury cars today allow you to operate the car's controls like satnav, climate control etc by such software. Later on companies have been trying to develop software that is able to recognize more natural speech rather than predefined commands. Right now we have Siri and comparable services. Am am sure these things still have a long way to go until they truly work like Start Trek has shown us. But when Star Trek has first shown it, we all went "That would be awesome, but totally impossible!". Not the answer you're looking for? Browse other questions tagged design-principles or ask your own question. Can you describe the attributes, properties, and/or elements that make a user interface pleasing to the eye? How to decide between “consistent user interface” and “adequate user interface”? What are the main contributions of Apple Inc. in the advancement of user interfaces in the last 10 years? What interaction design (or UI) principles are adapted from bionics?